Contents: 3 Canisters and 3 Bags Order today for complete RV Odor Control! Tobacco smoke, kitchen, road kill, skunk, gasoline, smog, "doggie", urine, mold/mildew, bathroom, and holding tank odors are common odors that stink up our RVs. Air fresheners just mask the odors and often smell worst than the offensive odor, RV detailing is expensive, and shampooing often just spreads the smell around. 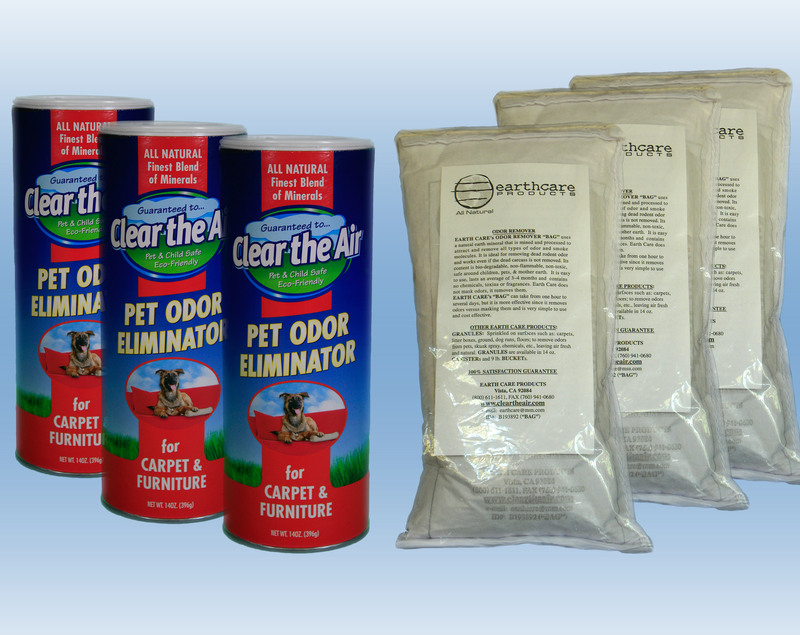 Earth Care Odor Remover Bags can simply be hung in your RV and they will completely eliminate RV odors. Earth Care draws in odors like a powerful magnet. The odors are absorbed, and neutralized without any fragrances. It is made from an all natural mineral, is non toxic and biodegradable and safe for Planet Earth. It is also safe around children and pets. It does not have to come into contact with odor producer to eliminate the odor. Earth Care does not cover up odors it literally "clears the air" leaving the air fresh and clean. Hang one bag in bathroom, in kitchen area, and in bed area, or where odors are strongest. 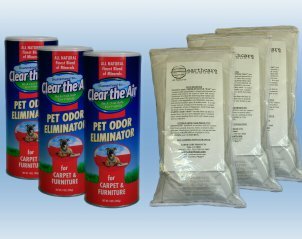 Sprinkle Clear The Air Odor Eliminator for Carpets and Furniture on all upholstery and carpet. Use all 3 canisters. Leave down 24 hours and sweep or vacuum. All odors will be completely eliminated. Bags should be left in RV. They will continue to eliminate new odors for up to 3 months. They can be put under seats or behind cabinets if you want to hide them, once strong odors are eliminated. Leave a couple windows open for air circulation when treating the RV. Click Here to learn more about RV odor removal.